Most of us who carry daily make a choice between comfort and ease of shooting with our choice in EDC pistols. I happen to carry a full size M&P 9mm. As an early concealed carry person, I was sure carrying such a gun would be super uncomfortable and noticed by everyone. Over time, I gradually learned how to conceal my sidearm better and more comfortably. It has also become plainly obvious to me that while open carrying, many people don’t see a full-size gun on my hip. My girlfriend is an LEO. She carries a full-size gun as her duty weapon—Glock 22. For her concealed carry option, she is much more comfortable with a Glock 43. She is a small girl and concealing a full size is not realistic, especially in anything resembling fashionable women’s clothes. She is also a few months away from becoming an School Resource Officer (SRO) for her Sheriff department. That got me thinking about her other duty weapon, an AR-15. I am a reluctant convert to the AR-15. For the longest time, I didn’t want a rifle with a bullet less than 130 grains. With the purchase of my first AR (about 10 years ago), it really began to change my mind. My late wife was able to utilize the AR (5.56) platform with much more accuracy, endurance, and no recoil pain or flinch. Then, I discovered non-standard calibers for ARs. My collection has grown like a bunch of unattended rabbits. I currently have many 5.56 configurations and at least one AR in .300 BLK, 9mm, and .45 ACP. The Sheriff department that my girlfriend works at has an SOP of keeping the issued AR in the trunk of the patrol car. This is as much to do with not scaring anyone by walking it into the school each day as it is with the budget not stretching far enough to have a gun safe and an onsite AR in the school SRO office. As often happens, my mind mulled over the concept of appropriateness of the AR as the choice for the tight confines of a school. It occurred to me that the familiar manual of arms for the AR makes it a great choice; but the 5.56 caliber might not be optimal. The ballistics of 5.56 are not great for close work and offers a huge chance of over penetration, incredibly loud muzzle blast, and dramatic performance losses with less than a 16-inch barrel. By switching to a pistol round, most of those issues will be mitigated while still retaining the familiar manual of arms. In a school setting, most engagements will be within 25-50 yards. 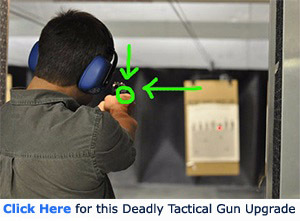 That is definitely a long shot in a high stress environment with a duty pistol. Transitioning to a 10-12” barrel AR chambered in 9mm would make a lot of sense, especially when her department trades their Glock 22s for Glock 17s. They could have ammo and magazine compatibility quite easily. Making this choice would increase accurate engagement range and decrease the size of the platform for easier maneuvering in the tight confines of hallways and classrooms. My suggestion would be to use an AR-15 pistol that runs Glock magazines. Equip the pistol with primary 1-4 x 24 scope from Vortex, Sun Optics, Leupold and / or a 45° offset reflex or red dot sight with instant on capability: Aimpoint, Holosun, Primary Arms… and a pistol brace such as the Gear Head Works Tailhook Mod 2. The brace would provide an adjustable stock option. Officers of different sizes can adapt the firearm to them instead of the other way around. Having the 10”+ barrel would match point of aim / point of impact (with a 25 yard zero) out to 100 yards, with Speer 124-grain short barrel cartridges. Other loads would provide similar performance. For tight confines, such as a classroom or hallway, the disadvantages of the standard 5.56 AR-15 stand out. By switching to a pistol caliber (specifically 9mm), most of those disadvantages disappear and no real disadvantages occur. Even if you leave the tight confines for the more open space of the recess field, the range of the shots taken would rarely exceed 50-75 yards. This would almost directly transfer to home defense, especially for those who live on a lot larger than .20 acres. I currently utilize a .300 BLK pistol for that purpose, mainly because I do not have a 9mm suppressor and I do have one in 30 caliber. 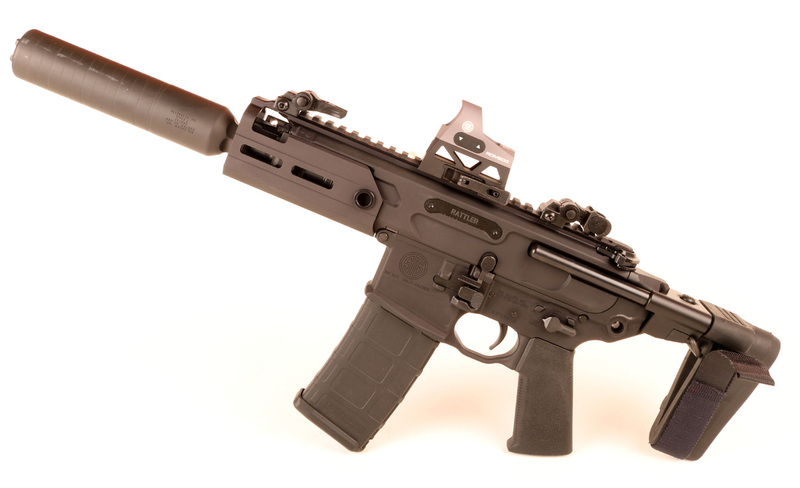 What is your opinion of a pistol caliber carbine for engagements out to 100 yards or a .300 BLK? Share your answers in the comment section. Why would you suggest a short barrel cartridge with a ten-inch barrel?